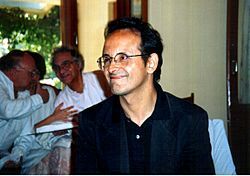 Francisco Javier Varela García (September 7, 1946 – May 28, 2001) was a Chilean biologist, philosopher, and neuroscientist. Varela was, with his teacher Humberto Maturana, best known for introducing the concept of autopoiesis to biology, and for co-founding the Mind and Life Institute to promote dialog between science and Buddhism. 1992 (with P. Bourgine) eds. Towards a practice of autonomous systems: the first European conference on artificial life. MIT Press. 1992 (with J. Hayward) eds. Gentle bridges: dialogues between the cognitive sciences and the Buddhist tradition. Boston: Shambhala Press. 1993 (with D. Stein) eds. Thinking about biology: an introduction to theoretical biology. Addison-Wesley, SFI Series on Complexity. 1997 (ed). Sleeping, dreaming and dying. Boston: Wisdom Book. 1999 (with J. Shea), eds. The view from within: first-person methodologies in the study of consciousness. London: Imprint Academic. 1999 (with J. Petitot, B. Pachoud, and J-M. Roy) eds. Naturalizing phenomenology: contemporary issues in phenomenology and cognitive science. Stanford University Press. Francisco Varela Facts for Kids. Kiddle Encyclopedia.